At Allpro Contracting, our Tinley Park remodeling contractors have the skill necessary to assist you with all your property improvement goals. Our team is ready and eager to assist you with any type of project. We are adept at both interior and exterior remodeling services. Our remodeling contractors specialize in concrete paving, roofing, siding, and whole-house remodeling. So whether you’re investing in a major interior remodeling project or a single concrete patio in Tinley Park, we always work our hardest to achieve the highest level of customer satisfaction possible. Call Allpro Contracting today if you need to hire a professionally licensed remodeling contractor in Tinley Park. Our courteous and polite staff would be happy to take your call. Our experts will discuss your prospective project with you and help you develop the best plan to accomplish your goals. We can schedule your appointment today. Stamped concrete is an amazing building material. It can be used to achieve nearly any aesthetic taste or design. If you want to make a remarkable change to the look of your property’s exterior, you should consider constructing a stamped concrete driveway, patio, or walkway around your home. Our Tinley Park exterior remodeling contractors have the knowledge, skill, and experience necessary to help you with this entire effort. We have been providing exceptional concrete paving services to the local community since 1962. 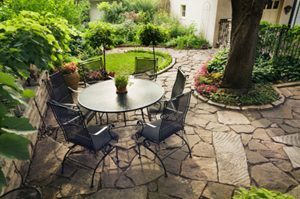 You and your family are guaranteed to be pleased with your new hardscaping features for decades to come. In addition to the amazing hardscaping and paving services that we provide, our Tinley Park professionals also specialize in wood deck and fence design and construction. A new deck provides you and your family with the perfect vantage point from which you can enjoy your entire yard. A beautiful decorative fence can enhance the curb appeal of your residence while improving the security that you and your family enjoy within your home. If any room is the heart of your home, that room is the kitchen. Your kitchen is absolutely integral to your most joyous moments. Whether you are sharing a meal with close family members or entertaining friends and guests, your kitchen must be designed to accommodate all of your needs. Through a kitchen remodeling project, you can make each and every one of these moments more rewarding and joyous. If you are looking for a professional Tinley Park remodeling contractor for patios, driveways or other interior and exterior services, then please call 708-658-3500 or complete our online request form.